The Cowal shoreline, deeply indented, forested, wrapping itself around islands, is a wonderful area to explore by boat. Remember also that for millennia it was the water which acted as the highway, the medium of transport, around the west coast of Scotland. Waterways connected people; land, forests, marshes and trackless highlands kept people apart. So those who come to Cowal by boat are not only going to have a lot of fun. They are also going to share most closely the mental maps of the first monks, farmers, preachers and fishermen who occupied early medieval Cowal, and who almost always built their homes and their churches close to the sea. 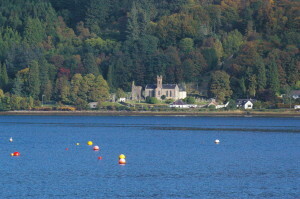 St Munn’s Church, Kilmun (Cille Mhunnu), on the shore of the Holy Loch, is probably one of the oldest Christian sites in Argyll. The sailor-pilgrim exploring the coast of Cowal ought to get a copy of the ‘bible’ of these waters. 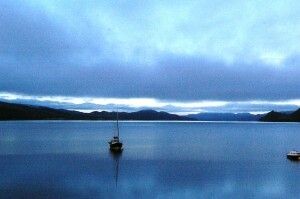 That is The Firth of Clyde, produced for the Clyde Cruising Club. Vital sailing directions, plans, photographs and an updated text published by Imray (2012) for £27.50. All the anchorages, moorings, jetties and marinas that you could want, it is a worthwhile investment. You can also get some useful information from the free on-line publication, Welcome Anchorages, which you will find at here and is also available in print from most marinas and boatyards. You might also want to have a look at the useful website of Sail Scotland, which has a section on the Firth of Clyde. 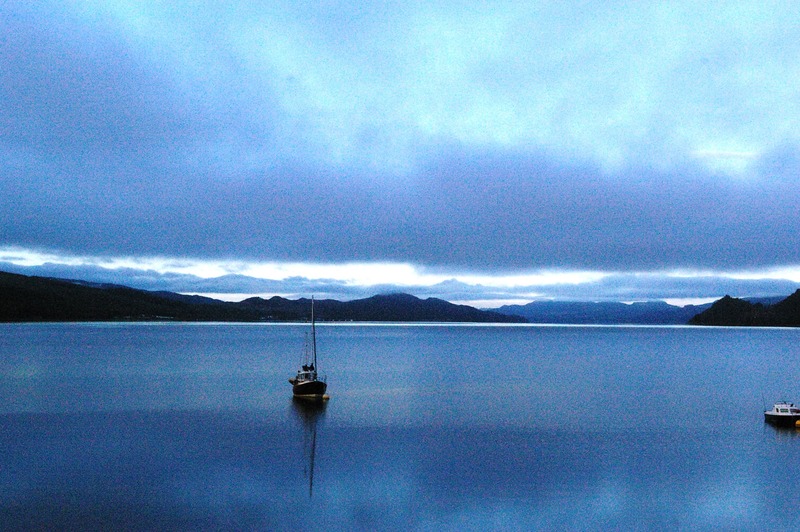 Further up Loch Fyne shore is the Oystercatcher, where customers can moor their boats. Even further up the loch is the pier of the Strachur Bay Moorings Association. They have two moorings available to visitors and a short-stay landing pontoon. For overnight stayers you are asked to put £10 a night in the honesty box. Going along the coast in the opposite direction, south from Portavadie, you come round Ardlamont Point and sail into the Kyles of Bute, Cowal to the west and Bute to the east. On this stretch of shore, going round the Kyles,you will come first to Kames (Gaelic camas ‘bay’), where there are fifteen moorings at pier, close to the Kames Hotel, and a gentle beach to land your dinghy. A little further north at Tighnabruaich there are free moorings and boat ramps at the village and at the Royal Hotel. Going round to the eastern Kyles of Bute, to Colintraive, you will find six moorings for guests provided by the Colintraive Hotel. 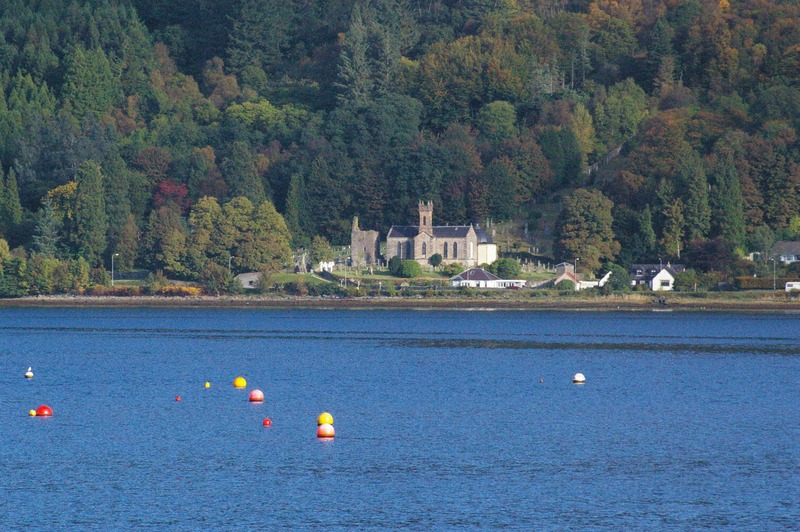 On the east side of Cowal you will find moorings in the Holy Loch, close to Dunoon (the main town of Cowal with plenty of facilities) at the Holy Loch Marina. It is in a fine natural harbour with all the facilities you would expect, open all year with berths, fuel, storage etc. Contact info@holylochmarina.co.uk, or 01369-701800. Further north still, at the far north-east of Cowal, is Loch Goil. Here you will find moorings near the entrance of the loch at the Carrick Castle Boat Club (£10 a night to be put in the honesty-box or paid on line). The shore and landscape round about are lovely, with Carrick Castle itself a powerful presence nearby. And at the head of Loch Goil (aka Lochgoilhead! ), in a beautiful sheltered spot, is the Lochgoilhead Jetty with several berths for visitors (who are asked to pay a donation of £10 a night). It is close to the Goil Inn and other amenities, and the local very ancient church of Lochgoilhead, ‘the church of the Three Holy Brethren‘ is two minutes walk away. For anchorages around Cowal, of which there are plenty, see the publications and websites mentioned above.